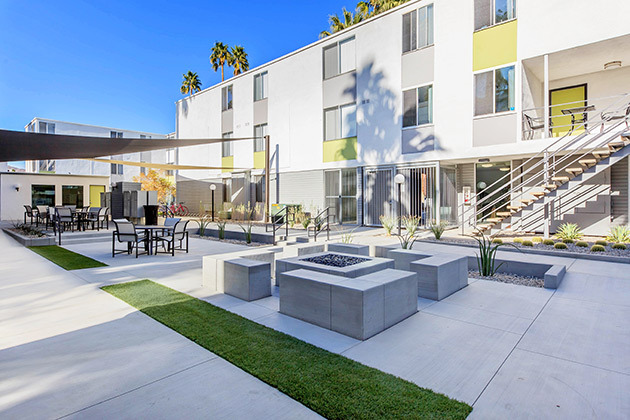 Walker & Dunlop, Inc. announced today that it has structured $10,806,000 in financing for Prism Multifamily Group’s acquisition of Latitude 33, a 121-unit, Class A multifamily property in downtown Palm Springs, California. Latitude 33 holds significance for Palm Springs, which is home to only nine market-rate apartment communities with 100 or more units each, making for an important investment in a supply-constrained market. Palm Springs has demonstrated consistent rent growth and strong occupancies, which reflect a growing demand in an area that has been gaining in popularity and has benefited from a resurgence in tourism. “Prism Multifamily Group is excited to be able to enter the California market with our acquisition in Palm Springs. We feel that the Coachella Valley – and Palm Springs in particular – is maturing from a seasonal vacation spot to a year-round place to live,” said Mark Zolty, President of Prism Multifamily Group. Built in 1965, Latitude 33 operates under a 99-year ground lease that is regulated by the United States Department of the Interior Bureau of Indian Affairs. The property underwent a comprehensive renovation and repositioning in 2016. Since then, Latitude 33 has generated high demand and has maintained a strong competitive advantage due to its excellent downtown location. Latitude 33 features lavish amenities such as a resort-style swimming pool, grilling stations, and a private courtyard with shade sails. It is ideally situated just steps from restaurants, nightlife, and entertainment in Palm Springs.